Construction underway at the Aurizona Gold mine. Photo by Equinox Gold. 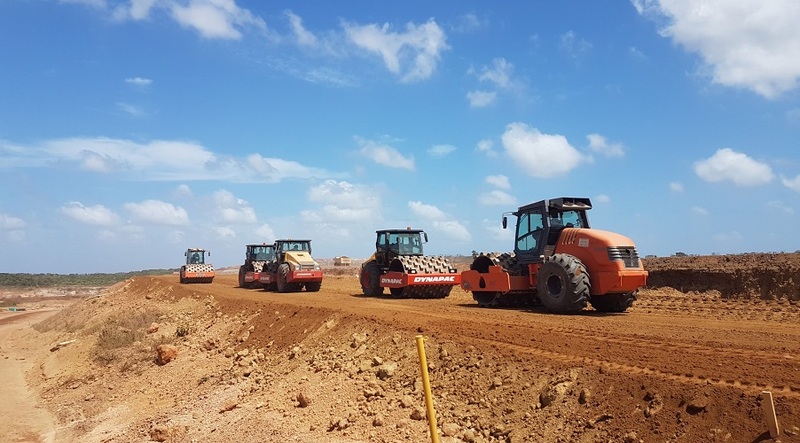 Recently formed Equinox Gold (TSX-V:EQX) announced that its board of directors approved $146 million for the full-scale construction at the Aurizona Gold mine, located in the Maranhão state of north-eastern Brazil. With the idea of pouring gold in late 2018, the company says it has already spent $25 million advancing detailed engineering work, raising the existing tailings facility, refurbishing existing plant infrastructure, conducting civil earthworks and pouring foundations to prepare for the installation of new plant infrastructure and administrative buildings. “This will be a milestone year for Equinox Gold as we advance Aurizona and transition the company from a developer to a meaningful producer, with more than 135,000 ounces of annual gold production expected," CEO Christian Milau said in a press release. In detail, the Vancouver-based firm wants to raise the existing tailings facility to support expanded throughput to 8,000 tonnes per day and it is also refurbishing the process plant so that it is able to treat the higher amount of ore through a combination of conventional gravity concentration and cyanide leach/CIP (carbon in pulp) processes. To support increased production, Equinox says it also plans to upgrade two power substations, one located at Manaus do Maranhão and the other at the Aurizona plant site. The mine is a past-producing open-pit operation occupying a 2,250 km2 land package. After yielding a total of 329,042 ounces of gold over a period of five years from 2010 to 2015, Aurizona ceased work because former owner Trek (back then called Luna Gold) said that it needed to raise money to build new crushing and grinding circuits to handle tougher ore.